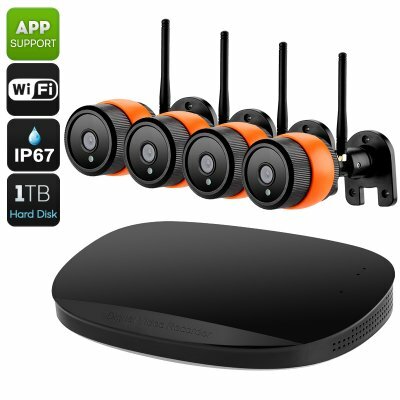 Successfully Added NVR Security Kit - 1080p Support, Motion Detection, IP67, 30m Night Vision, App Support, Remote Access, 1/4 Inch Sensor to your Shopping Cart. Upgrade your security and protect your property in a way it deserves with this magnificent NVR kit. Coming with four Full-HD digital cameras’, this home security system will capture everything that is happening around your property – ensuring that not a single unwanted visitor gets close. Offering around the clock surveillance and remote access, this NVR security kit has been specially designed to safeguard your home or business at any time. Featuring next level technology, this NVR kit takes advantages of wireless connectivity through which it allows you to link your cameras’ to your NVR box without the need of any physical cables. Simply place your 960P cameras’ wherever you feel extra security is needed. As no wiring process is needed you’ll be able to simply screw your security cameras’ to your wall without the hassle of time-consuming and costly cable installation processes. Additionally, this allows you to simply detach your camera whenever needed – letting you easily change the position of your camera as many times as you wish. As your NVR system will be connected through a network, you will be able to easily access your recordings from afar - allowing you to watch back and analyze the footage no matter where you are located. Supporting its own mobile application, you will furthermore be able to access your NVR systems on your mobile phone, ensuring that you’ll always be able to stay up to date on the latest security status of your property. Coming with a 1/4 Inch CMOS sensor, the HD cameras of this NVR kit are guaranteed to deliver clear and detailed images. Supporting night vision, you will be able to record the clearest images even after dark up to a distance of 30 meters. With this security kit at hand you can be assured that you’ll be able to enjoy top level around the clock protection – ensuring that you, your family, and your property will be constantly guarded and safe from potential outside intruders. Rated as IP67 waterproof, the cameras’ of this NVR kit can be used perfectly for both inside and outside security purposes. Featuring motion detection, this NVR can not only be set to guard and record pre-selected areas – but it can also be programmed to start recording when mention gets detected in a certain area. Like this, you can be assured that you’ll save storage on your built-in 1TB drive as your security system will only record footage when motion is detected. Arabic: - طقم الأمن NVR - Chinese Simplified: - NVR 安全工具包 - Czech: - NVR bezpečnostní sada - Dutch: - NVR Security Kit - French: - Kit de sécurité NVR - German: - NVR-Security-Kit - Hebrew: - ערכת אבטחה NVR - Hindi: - NVR सुरक्षा किट - Hungarian: - NVR biztonsági készlet - Italian: - Kit di sicurezza NVR - Japanese: - NVR セキュリティ キット - Korean: - NVR 보안 키트 - Malay: - NVR Keselamatan Kit - Norwegian Bokmål: - NVR sikkerhet Kit - Romanian: - NVR Kit-ul de securitate - Russian: - NVR комплект безопасности - Spanish: - Kit de seguridad NVR - Thai: - ชุดรักษาความปลอดภัย NVR - Turkish: - NVR güvenlik seti - Vietnamese: - Bộ an ninh NVR.